Through the years you can gather many Christmas tree decorating ideas so that your tree is filled with treasured memories. Your family can have a simple arrangement, or a wonderful display for the birthday of Jesus. 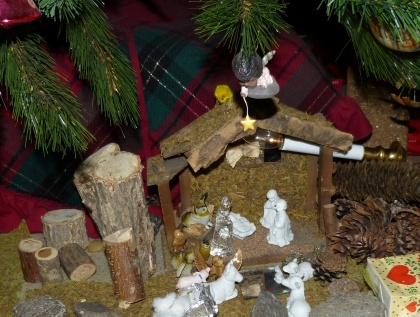 Over the years your favorite ideas may be Nativity scenes, homemade ornaments, decorations the children have made, and tiny gifts. Some statues and toys make unique decorations. Keep an eye open for what works for you. Below you'll find pictures of Jesus and Mary in wooden frames made of popsicle-sticks and holy cards. You can use little slippers, and baby mittens. They're simple treasures and gifts from your own life and from family and friends. For years after we were married the only "presents" we bought each other were Christmas decorations. Then our children began to make ornaments and family and friends have shared their treasures. If you're just starting, be encouraged there are many simple Christmas tree decorating ideas that reflect the Christmas season and can brighten your tree. One of our little ones made the homemade angel ornament at the top of this page using a clothes pin, embroidered half circle, and gold card stock for the wings. It was a trick to hang this treasure, so we punched two holes in the wings for a wire to go around the neck. The outfit ties to the clothes pin with a ribbon that is attached to the top of the tunic. 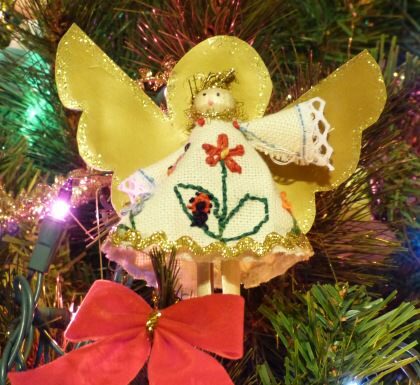 My husband's aunt made us a set of crocheted angel ornaments years ago and they still look as inviting as they did over twenty years ago. Ever since then we've collected many angel decorations for our Christmas tree. 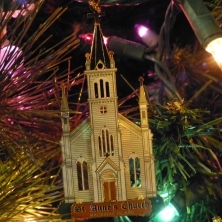 They help keep a religious theme in mind, especially as we often say our Rosary near the tree during the Christmas season. 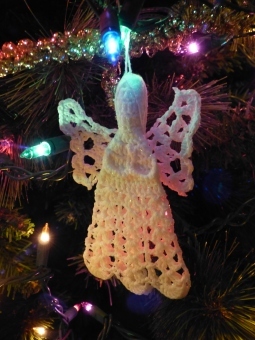 Crosstitch and crocheted angel ornaments. Tiny treasures from the past. Easy and inexpensive Christmas tree decorating ideas using homemade Christmas ornaments. Because we have a dear relative that used to send us a Nativity scene every year, we put them everywhere; but our favorite place is under the Christmas tree. We're a little old for getting on the floor so we put our main Nativity on the buffet at the beginning of Advent, and our youngest imitates us with his scene under our tree. At the beginning of Advent we start with an empty stable and add pieces as the people would be coming: Joseph and Mary just before Christmas, Baby Jesus late Christmas Eve, the shepherds and sheep next, and the Magi on January 6th, the feast of the Epiphany. After that, the actors begin to leave in reverse order. 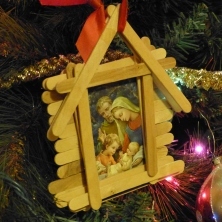 Wooden Popcicle Frames on Christmas holy cards. Wooden Popcicle sticks frame Christmas cards. Since the Reason for the Season is Jesus' Birth and His Christ Mass we treasure the homemade Christmas ornaments that our children have made using popsicle sticks and holy cards of the Nativity. One of our children made his as a school project and the next year we made them as gifts for friends – of course, we kept one too. I'd love to have twelve more of those so that looking at the Christmas tree is more of a reminder of Jesus, more of a meditation on the Joyful Mysteries of the Rosary. 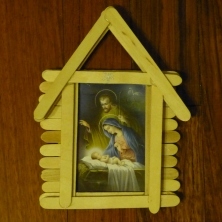 Simply lay a bed of popsicle sticks and glue the cross pieces as frames to your holy card or old Christmas card. Make a second layer and add a roof. Dry. Tie with a ribbon and hang. We wrote the year and "From the Fifers" on the ones we gave as gifts. A sharpie worked very well for the writing. Another favorite decorating idea is to put photos in tiny frames to hang on the tree. 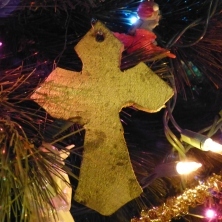 Gold cross Christmas tree ornament. Other homemade Christmas decorations that we treasure are the wooden ornaments that our son made when he was beginning to use our scroll saw. One of us drew the pattern and he traced it to wood and made the cuts. He was able to give those as gifts that year, too, one for each of the aunts and uncles. St. Anne's Catholic Church Ornament. What do you do with souvenirs? If they're small and sweet, they're perfect as Christmas tree decorating ideas. We have several that remind us of past and joyful times. This one is of Saint Anne's Catholic Church on Mackinac Island. The gold, red, and white colors make this ornament perfect for Christmas. If you ever have the chance to visit, do! Here's another souvenir. A tiny pair of Dutch wooden shoes with a traditional picture of windmills. 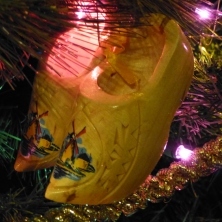 When they don't hang well, they sit nicely on a Christmas tree bough or limb. 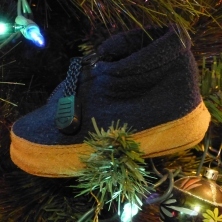 What do you do with your baby's slippers? We hung our favorite pair on the tree. You can do the same with baby shoes or tiny toys. "Oh, Mom! Those were my favorite gloves! Please don't give them away." 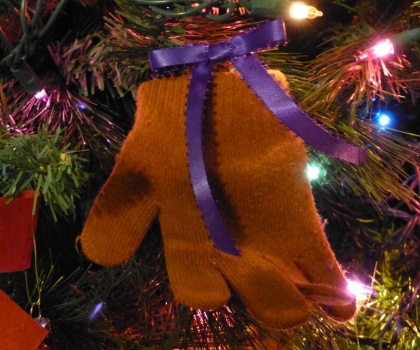 Use a Christmas tree skirt to catch needles from the tree and maybe save an ornament from breaking. One year we found a quilted tree skirt and thought, "Perfect! This may save some of our breakable decorations." It has saved many glass ornaments from breaking. You see, as the years pass there are many treasures you can put on the tree that cost very little and will be treasured for many years to come. Take a look around your home for more Christmas tree decorating ideas. Keep the smallest items at the top and non breakable larger items toward the bottom. Merry Christmas from all of us at Saint Anne's Helper!